Here is perhaps a perfect example of a missed opportunity. The International Bar Association recently released a Phase I Report on Drivers for Change in Legal Services. If you look at the Table of contents, it is a literature review done quite scientifically with computer assisted methods (such as Natural Language Search & Processing technologies). You can access the report here or watch the 20 mins video here. Why would this Phase I Report be a missed opportunity? Have you ever blissfully followed the instructions of your GPS only to end up nowhere? Guilty. At least, I was the only one to suffer, I lost time, albeit listening to good music, so not a complete loss. But this report... It fails to give proper focus to two areas deserving of immediate, continued and careful attention: the future impact of AI on the legal profession and the changing expectations of clients in relation to multidisciplinary advisory services. I am concerned that these two huge change vectors are somehow lost in the noise of other drivers in the Report. Perhaps I am am unfair in expecting from a Phase I report an analysis of the Literature Review, but I do, if the Report was meant to have a prospective focus as the title implies. Are there any emerging trends that are missing or underrepresented? Of all the identified trends, which are likely to fundamentally alter the nature of our profession? Should the Legal Profession attempt to proactively steer or influence these trends? In the affirmative, what can the legal profession do to proactively steer these trends? In Phase 2, Task Force members will discuss, debate and identify what the IBA can do for its members to enable them to cope with change, manage change, or prevent change. This will be a value-add to the existing body of knowledge. In Phase 3, the task force will conduct independent research with the bars and IBA committees to determine the tactics likely to have the best leverage helping IBA members deal with the global changes identified. And finally, the task force will publish reports as appropriate. 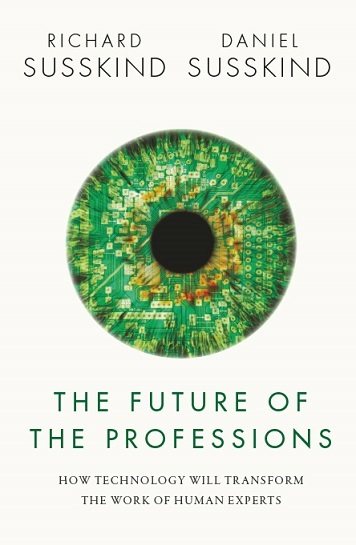 I strongly urge all members of the Task Force, if they have not done so, to carefully read The Future of the Professions. Why? Lawyers are knowledge workers. Knowledge workers typically need to consume vast amounts of information, internalize it in the form of knowledge, exercise skill and judgment (often based on past experience) to further consider a given set of information to articulate and recommend a legal solution to a given problem and to complete the related legal tasks and deliverables. That consumption of information to produce legally informed solutions is a reserved act at the heart of the legal profession. Lawyers can and do assume other responsibilities of course, but this is the one I choose to focus on. We can no longer safely assume that the heart of our profession will be exclusively performed by human beings. In their book, the Susskind authors remind readers that all professions are the result of explicit or implicit social pacts between society and self-regulated professions: in exchange of the powers to self-regulate, we the citizens grant you exclusivity to perform specific acts and impose on you a duty to protect the public. This pact was necessary in an era of increasing specialized knowledge for which the wrong application of knowledge can have devastating effects (think surgeons, engineers and auditors of pension funds). What if the application of this specialized knowledge was not the exclusive purview of human beings? Enter the world of Artificial Intelligence (AI). If you are unfamiliar with AI and want an academic synthesis on its current status and facets, I recommend you head over to the Stanford University ai100 web site. Will the Task Force have an AI Expert included in its Phase II deliberations? Will our law societies specifically consider the issue of how AI will change the nature of our profession and facilitate the steering of this change in an optimal direction for the public? The reason why AI is a fundamental driver that will affect the legal profession is simple. Unlike some other professions that require physical manipulations and emotional care & support (e.g. nursing, medical and psychology), law is a perfect area for AI to disrupt the provision of legal services because of its future unparalleled effectiveness and efficiency. The accounting profession has successfully positioned itself as a service provider with expertise vastly exceeding the scope of reserved acts throughout the world: for that, I give them full marks on being business-savvy. I wish my own profession (law) was more visionary in charting a similar course. Law societies and Bars sometimes hopelessly appear to be stuck in multidisciplinary-adverse paradigms and governance distractions which, bottom line, result in the passage of years with status quo on the nature of legal services while some other professions (like accounting) have made great strides in moving forward. There will come a time (some will argue we are even past that time) when the pressure of both client expectations and client sophistication will result in market forces that will dismantle the traditional big firm - big hourly fees model. The Big Four have high hourly fees but clients pay them because they expect the provision of multidisciplinary coherent advisory services. Hence they thrive. Will the International Bar Association specifically consider that point and invite multidisciplinary experts to their Phase II deliberations? Will our law societies specifically consider the issue of multidisciplinarity with (as lawyers like to say) an obligation of result, that is, producing recommended changes to legislation to enable different business models and free up the creativity of lawyers to embrace new business models? The reason why changing client expectations and sophistication should be given prominence is simple. Unlike most other trends, this is about the client, and the client we serve. No profession has the luxury of ignoring how society wants to benefit from the services of professionals. Law is no exception.